Johnny O’Callaghan’s true story, rendered as a comedy play, Who’s Your Daddy?, is one of those true life tales that has to be shared. Shared it he has, but here we get a revealing insight into the craft of writing, and then performing one’s own unbelievable story. 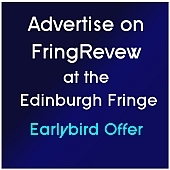 This entry was posted on Thursday, March 20th, 2014 at 12:49 pm and is filed under Audio Interviews, Edinburgh Fringe 2012. You can follow any responses to this entry through the RSS 2.0 feed. Both comments and pings are currently closed.